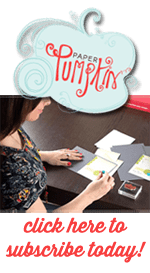 October’s Paper Pumpkin kit is filled with feathers and leaves in a variety of Fall colors. This month’s kit makes two different card designs and has several different sentiments to choose from. I love the Paper Pumpkin kits. It allows me to put together a bunch of cards, without having to think about designing something from scratch. The kits are all self-contained. The only thing you’ll need to have on hand is scissors and a clear acrylic back for the stamps. 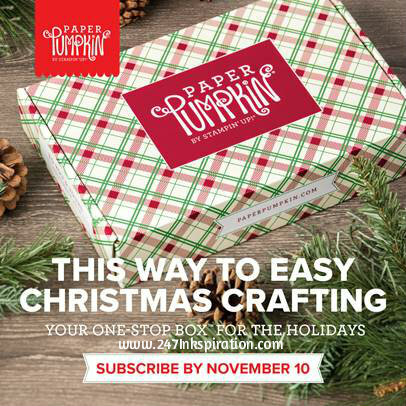 When you sign up for your Paper Pumpkin kit, you’ll get a free clear acrylic block in your first kit. Are you sad that you missed out on signing up in time to get this kit? Well, now is your chance to sign up for November’s kit. You have until November 10th to subscribe or redeem a pre-paid code to get this next kit. We don’t know what the kit will be, but it’s definitely going to be Holiday-related. We’ve been told November’s kit will make 10 cards; 5 of 2 unique holiday designs. If you want to make sure you have extra supplies on hand to make alternate projects, the coordinating colors are: Cherry Cobbler, Crumb Cake, Garden Green, Gold, Soft Suede, Very Vanilla, Whisper White. Do you own the Stamparatus? 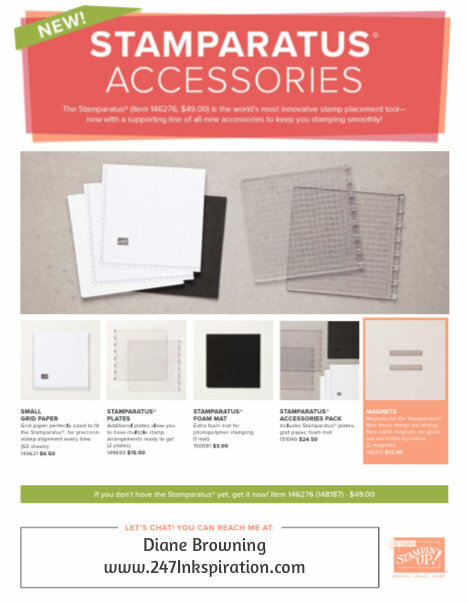 If so, you’re going to want to check out our brand new accessories for it. We have a couple new products designed to give you more use from this product. We have grid paper which is specially sized to fit the Stamparatus. This ensures that your paper is straight before you stamp on it. Extra plates for when you have those really big projects that use a lot of stamps. And an extra foam mat to give you better results when you use photopolymer stamps.